It Prudent to Use Fuse When Basic Matter Around Fuse is Known. Without Knowing Using Fuse Provides False Sense of Security. Here is Basic Details on Breadboard Fuse Holder and Fuse For Arduino Projects. It is practical to read our previous article on Types of Fuses, Fuseholders Used in DIY & Household to get an idea about what are the names of fuses. In this article, we will talk about cartridge fuse. We need a fuse if you want to limit possible damage if something got shorted. This is possible with faulty DIY benchtop power supply, for example. Another example of need is in certain situations when Zener Diode is used. Breadboard Fuse Holder is not the right terminology but PCB fuse with cover is correct terminology. As some asked us about breadboard holder, we believe that PCB fuse with cover is what a matter of seeking by some Arduino users. Fuses are rated by current, not voltage. And also their metal’s property of melting of “blow” time – fast or slow. Current = power/voltage. Arduino Uno, Arduino Mega have one 500mA resettable fuse to prevent accidental higher current via USB. It is astonishingly easy to destroy an Arduino board – simple shorting I/O Pins with HIGH to Ground, supplying more than 3.3V to 3.3V Pin, supplying more than 5V to 5V Pin are some basic examples. This is one reason, we prompt relatively newbies to use jumper wires not solid core wires. Chance of shorting with jumper wire is lesser – they unlikely to slip and touch an unwanted part. Arduino’s USB port is limited to 500 mA by the PTC self-resettable protection fuse. The jack socket is practical to supply with 6V and 12 V.
Vin I/O Pin has a dual function, input for external powering, is not protected by polarity inversions. It actually uses the jack socket’s diode. It is better to avoid. Arduino’s 5V Pin is directly connected to the regulator’s output, when voltage not applied to the USB Port or jack socket, this 5V socket can be even used to power Arduino with external stabilized 5V supply. It is also for reserved usage. Unfortunately, unlike household things, breadboard fuse holder with cartridge fuse has histories of passing higher current so that the breadboard itself melted. It is agreeable that breadboard fuse holder with cover looks great. These breadboard fuse holders desined to hold 5x20mm cartridge fuses. Glass cartridge fuses with Ampere values of 0.2A, 0.5A, 1A, 2A, and higher available. Fuse rating = (watts/volts) x 1.25. After current value is determined, the fuse to be used it’s rating should be selected as to be 135% of the calculated. Amps (A) is equal to the voltage V in volts (V) divided by the resistance R in Ohms. 5x20mm 0.2A to 20A cartridge fuses are available as 100 piece assorted kit or sold separately – 100 piece cost around $8. 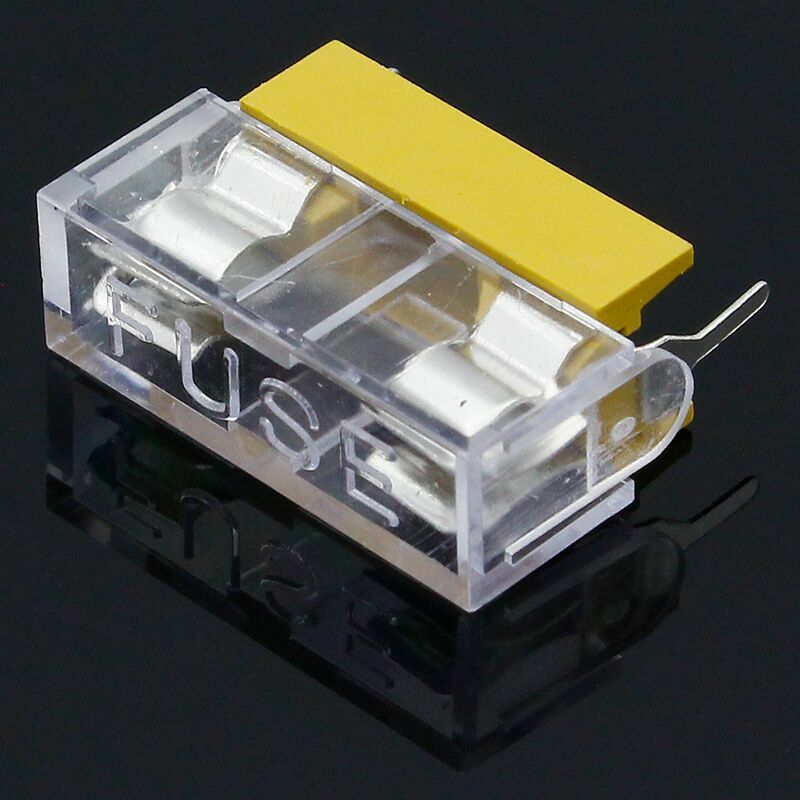 These China PCB breadboard fuse holder with cover cost less than 25 cents per piece. May be, you need to consider PTC resettable fuse? This Article Has Been Shared 1850 Times! ESP8266 WiFi Module is a Common Module Used in DIY Electronics Including Arduino. Here is Basic Theory Around Popular ESP8266 WiFi Module. Cite this article as: Abhishek Ghosh, "Breadboard Fuse Holder and Fuse For Arduino Projects," in The Customize Windows, May 25, 2018, April 25, 2019, https://thecustomizewindows.com/2018/05/breadboard-fuse-holder-and-fuse-for-arduino-projects/.